Kathy Cincotta’s newly released “Living By The Word Of God” is a moving testimony of God’s transformative power. “Living By The Word Of God” from Christian Faith Publishing author Kathy Cincotta is a stirring memoir and testimonial that glorifies God’s involvement in the author’s life when her world was falling apart in every possible way. “Living By The Word Of God”: an inspiring work of thanksgiving, is the creation of published author Kathy Cincotta, a practicing Catholic, Eucharistic minister, and Confirmation teacher from North Weymouth, Massachusetts. She is a married mother of three. “I’m in Church,” Cincotta writes. 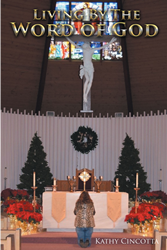 “The Blessed Sacrament is exposed; it is the season of Advent, and the alter is decorated in purple it is so beautiful! The peace it brings when I look at it, is what life is all about. It’s not about me or you! It’s about Jesus! Step aside! Let His light shine for all the world to see. As I look up at the stained-glass window to the right of the cross hanging, I see the words ‘You did it.’ I had just finished this book and emailed a copy to this publisher. Now I have to wait and see if they are going to publish it. I was really nervous; it’s not every day you let the world in on your sinful ways! Writing this book was the hardest thing I have ever done. On seeing those words, I knew I was obedient to what God had ask me to do: write the book. Whatever happens after this is in God’s hands. This book ends as it started: trusting, believing and living by the Word of God. Published by Christian Faith Publishing, Kathy Cincotta’s new book is a beautiful true story of a wayward believer who found her way back to the arms of God, ready for a new beginning in life. View a synopsis of “Living By The Word Of God” on YouTube. Consumers can purchase“Living By The Word Of God” at traditional brick & mortar bookstores, or online at Amazon.com, Apple iTunes store, or Barnes and Noble. For additional information or inquiries about “Living By The Word Of God”, contact the Christian Faith Publishing media department at 866-554-0919.